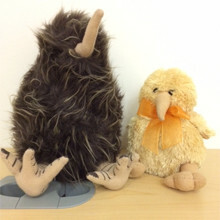 What he does: Chirps loudly to summon PixelSpoke employees to the Orange Room for meetings; enjoys his status as a well-known national symbol for New Zealand. Ula very kindly recently brought me a new friend who keeps me company and has a lovely chirp that is a bit more realistic than mine. Favorite place he’s traveled: PixelSpoke in Portland, Oregon, because the people are kind and encourage him to nest in piles of Mardi Gras beads. When he’s not working he’s … Eating small invertebrates, seeds, grubs, and many varieties of worms. He may also eat fruit, small crayfish, eels and amphibians.